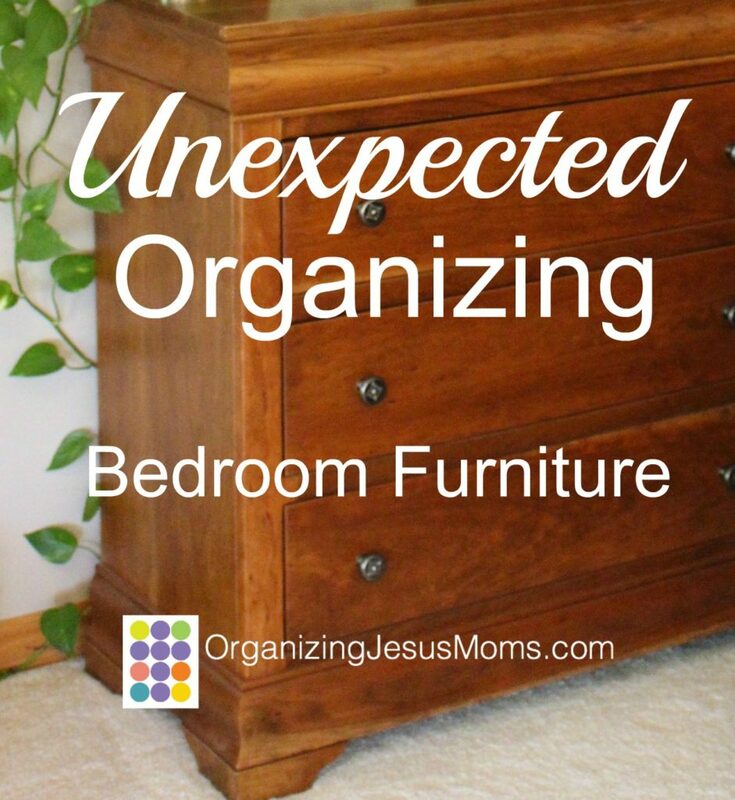 So, I’m kicking it off with one of my favorite unexpected organizing tips: Use bedroom furniture everywhere. 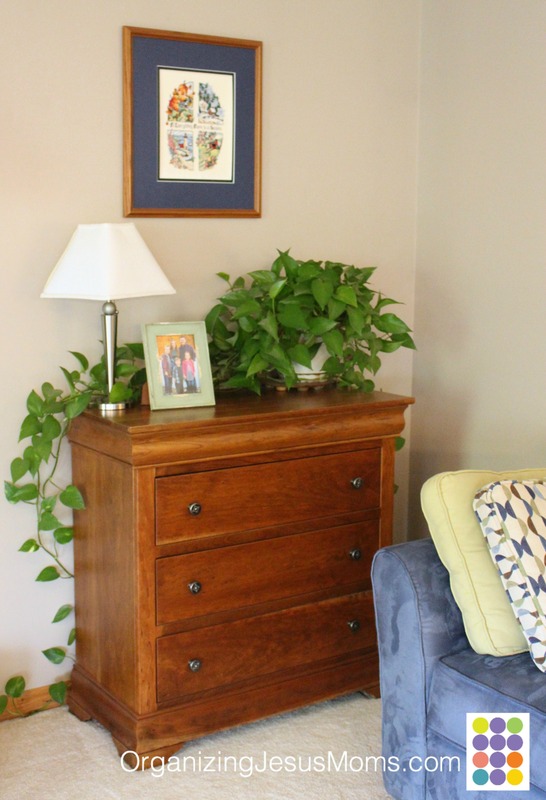 I’m talking dressers, armoires, and nightstands, all over the house. It has a simple, classic look. I love the warm feel of solid wood. 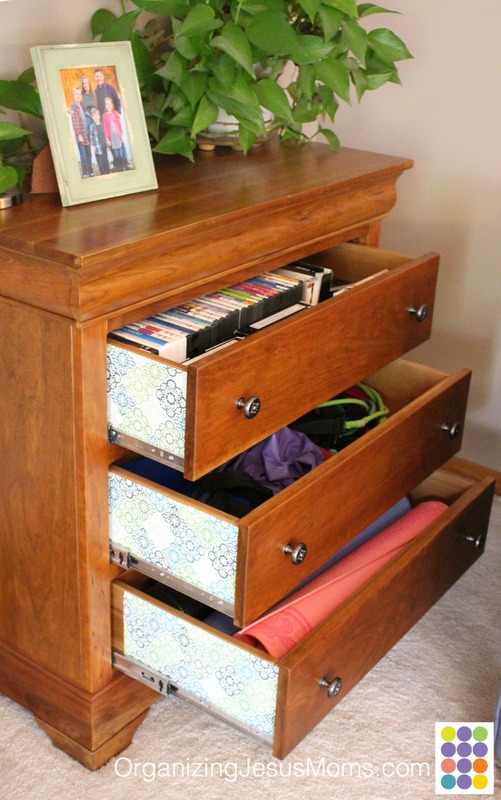 It can add storage to any room, so you can keep the stuff you use in any room right where you need it. It keeps things clean and dust-free. 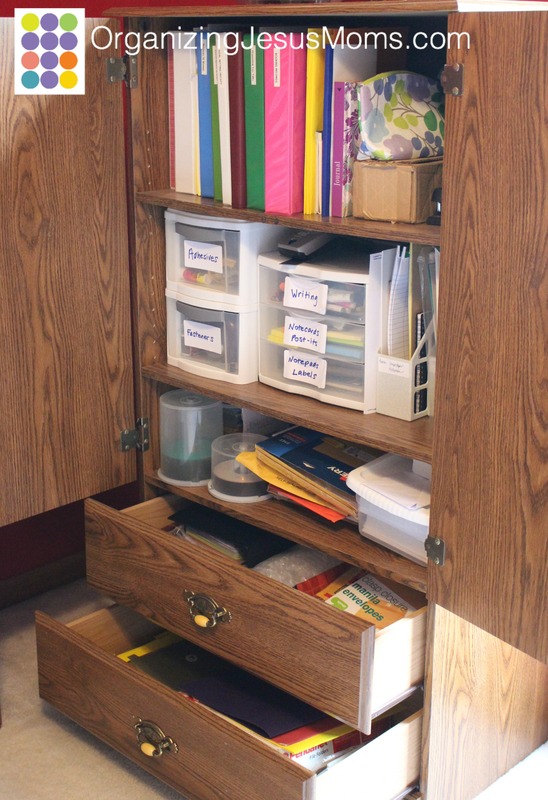 It has doors and drawers that close, thereby taking the view of “stuff” away and making everything look neat and tidy. It has doors and drawers that close, thereby limiting the amount of stuff you can keep inside. I can’t emphasize those last four points enough! 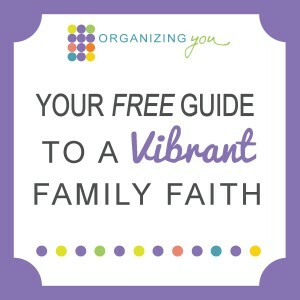 Bedroom furniture can clear out a lot of spiritual clutter by storing what you need where you need it, keeping things clean, hiding your stuff from sight, and forcing you to keep the clutter at bay. I’ll start with our Family Room. I exercise in my family room each morning. This chest of drawers holds my exercise DVDS (and VHS tapes—oh yes, I’ve been exercising at home for a long, long time!). 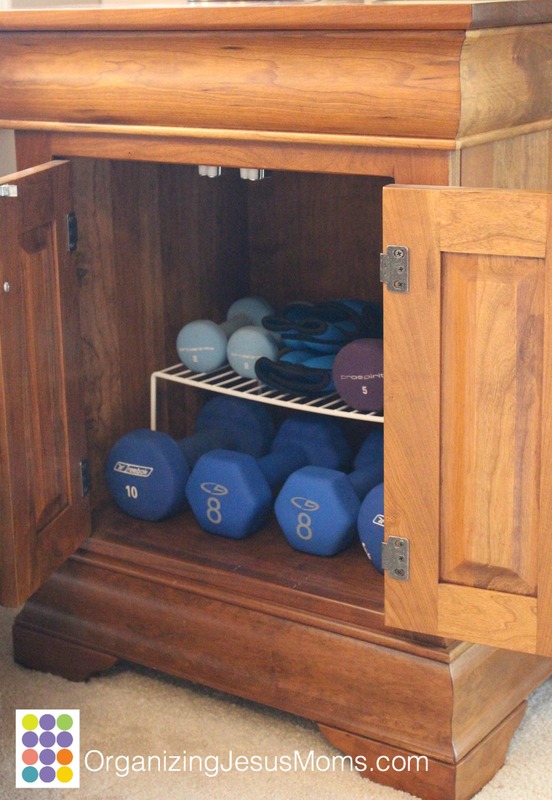 It also holds some exercise equipment like bands, discs, and mats. But when I don’t want to see it (which is actually all the time), I don’t have to. I also have a nightstand in our family room that holds my lighter weights. But if you were visiting my home, you wouldn’t know they were there. 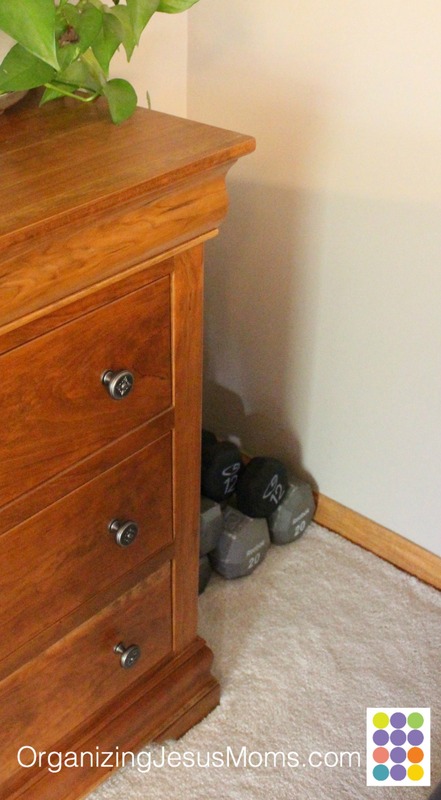 My heavier weights are tucked in beside the chest of drawers, out of sight but still easily accessible. What else do we do in the family room? We certainly watch TV, and that’s inside an armoire. 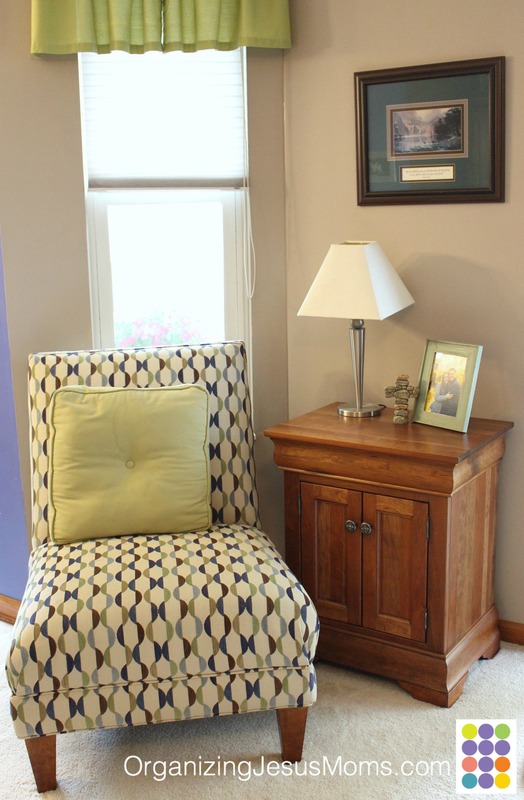 We have an end table with a drawer (to hold coasters and remotes) and a low shelf (that holds throw blankets). But we also play games. A lot of games. 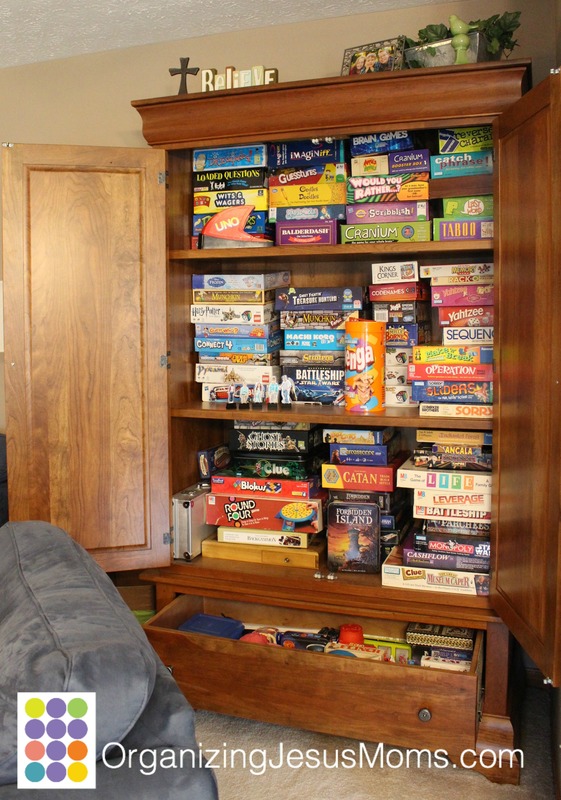 This game cabinet is a great example of the Natural Containment I recently blogged about. This piece of furniture should certainly be big enough to hold all of our games, so when the cabinet starts to feel stuffed (and it’s getting there), it’s time for me to let go of the games we don’t really enjoy, or that the kids have outgrown. The doors should close easily so my mind can rest easily that there isn’t a huge mess behind them. 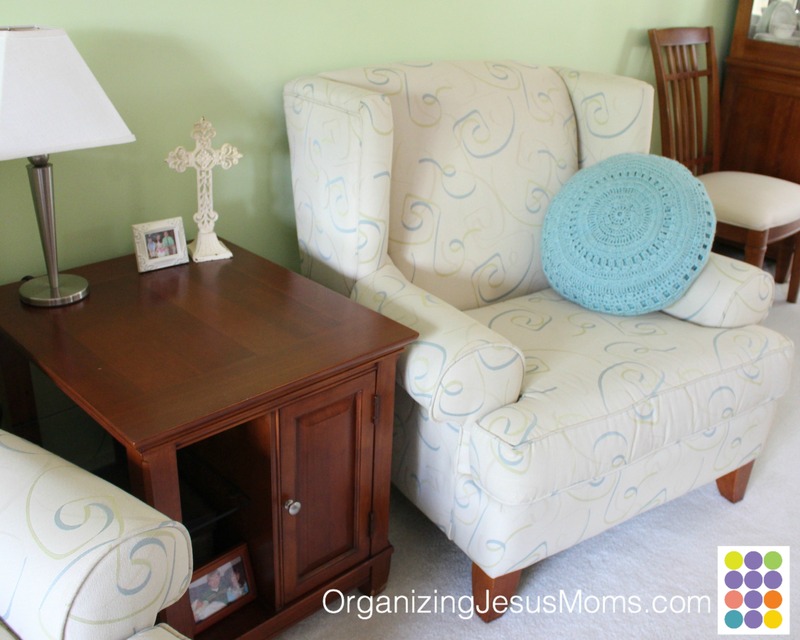 I use bedroom furniture in other areas of our house as well… in our small home office, a very old, inexpensive little armoire holds our office supplies and functions as Organizing You Ministries Central! 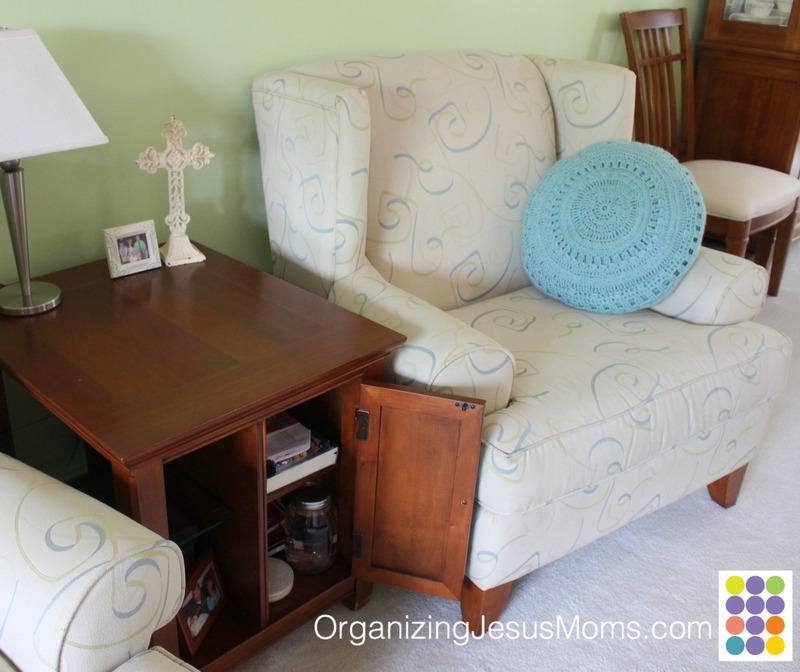 In our living room, this bedroom nightstand holds my Bible and other devotional materials right next to my Jesus chair (where I spend time with Him each day). Also, this little dresser keeps our pet cockatiel perched nice and high while holding his birdseed and other supplies inside the drawers. Pet supplies are great things to keep contained and out of sight, yet keep completely accessible right where we need them. 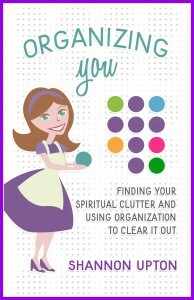 These are just a few examples of how bedroom furniture can clear the clutter out of your spirit! Would I like the look and feel of bedroom furniture in here? Could we use more storage in this room so we can keep the things we use here easily accessible? Would the drawers and cabinets inside pieces of furniture help us to limit our collections of stuff in this room? 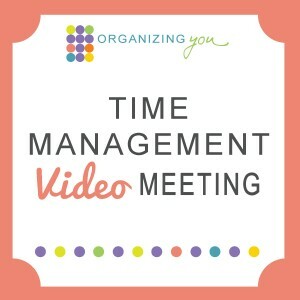 Would the room look neater (and stay cleaner) if we put our things in drawers and cabinets rather than shelves or bins? Am I willing to invest the money in these pieces? 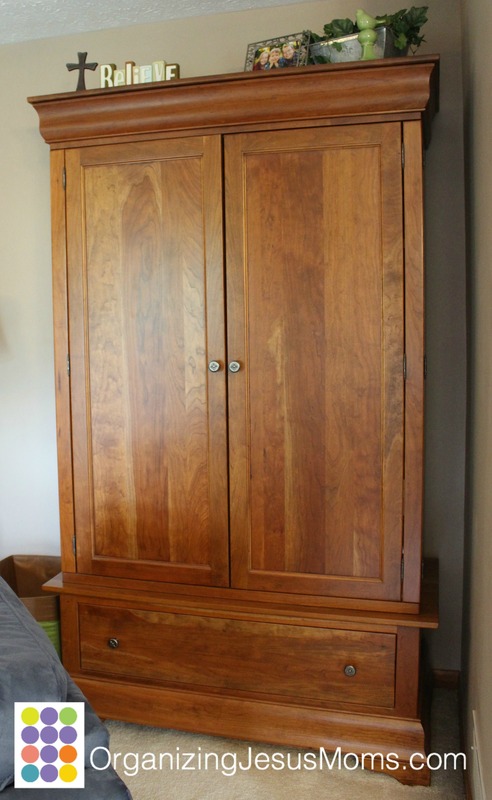 Do I have furniture I could move in here from somewhere else, or could I find pieces at garage sales or online? I hope you love adding some bedroom furniture to your home! Don’t buy furniture to hold things that you don’t need or love in the first place. 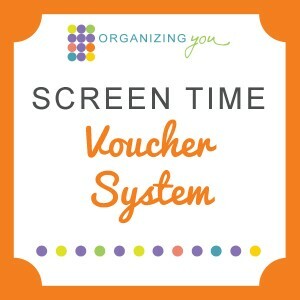 And don’t buy more furniture just to keep up with your growing amounts of stuff. Remember the Parable of the Rich Fool? 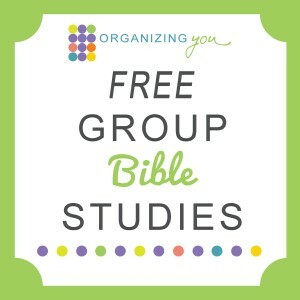 Jesus told the story of a man who had such a wonderful harvest that he built more barns in order to hold it all, then died the next day, taking none of it with him. Jesus tells us, “Watch out and be on guard against all greed because one’s life is not in the abundance of his possessions.” Yes, yes, Amen!! Keep only what you need and love, Friends! But store it well. 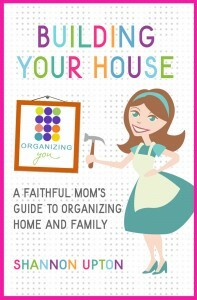 For more about organizing your home with Jesus, check out my second book, Building Your House. 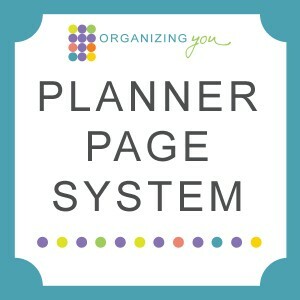 I think you’ll find that it’s an unexpected organizing book!